While we do have more advanced systems available, for small animals (dogs, cats, etc. ), we recommend the CTS-7700V. Light-weight and easy to operate, capable of sharp imaging, the veterinary CTS-7700V is an exceptional - and affordable - solution to your small animal vet needs. The portable CTS-7700V ultrasound system is an advanced, broadband marvel of clarity and quality. 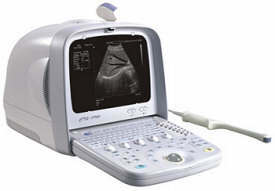 With its powerful features, such as 256 grayscale, 64-frame cineloop, internal image storage, computer interface, and high-density multi-frequency probes, this system is excellently suited to all of your standard veterinary ultrasound procedures. Our veterinary ultrasound configuration would come standard with either a 5.0/7.5/10.0 MHz multi-frequency linear probe (for adult cats and dogs), or a 4.0/5.0/7.5 MHz microconvex probe (for kittens and smaller cats and dogs). In addition, the linear probe would be equipped with athe optional custom detachable "stand-off" (for acquiring sharper images nearer the skin's surface by raising the effective working distance, and hence frequency, of the probe). For more information on our veterinary systems, you may submit our inquiry form and we will be in touch with you soon, generally within an hour or so. If you would like to talk with us right away, please call us at 800-839-0722.